Mental health • Program helps "members" rebuild lives through work, making them self-sufficient. 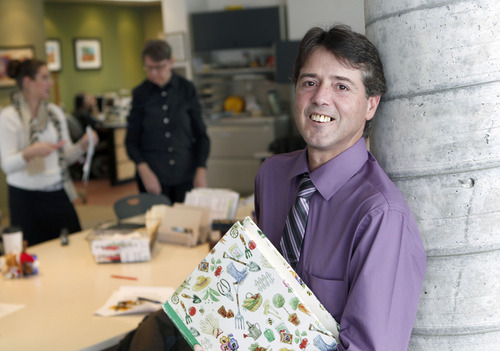 Al Hartmann | The Salt Lake Tribune Robert Grey, a three-year member of Alliance House, works in the business unit. He is bipolar and now, at 43, again works an outside job and has rebuilt most of the relationships that broke apart through the years. The nonprofit Alliance House, located in an old fire station at 1724 S. Main in Salt Lake City, serves people who suffer from severe and persistent mental illness. 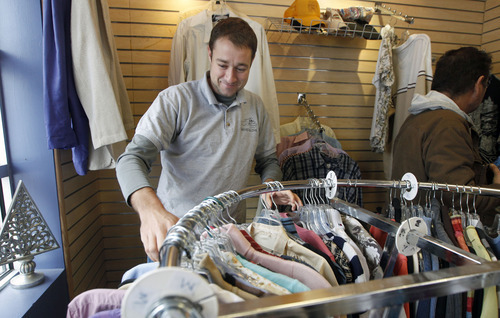 Al Hartmann | The Salt Lake Tribune Brandon Watson, a member of Alliance House, works in the "Clubhouse Close,t" a thrift store on the premises. It sells donated items to members for low prices. The nonprofit Alliance House, located in an old fire station at 1724 S. Main in Salt Lake City, serves people who suffer from severe and persistent mental illness. As members, they participate in all aspects of keeping the house functioning, whether it be cleaning, cooking, grocery shopping, meal planning, accounting, drafting the house newsletter, or working the thrift store. Staff, board members and members all relate on an equal footing and the goal is that members get strong enough to work outside jobs again and re-enter society. Al Hartmann | The Salt Lake Tribune John Barnhurst, left, a member of Alliance House, works in the kitchen with staff member Lia Espericueta preparing lunch. The nonprofit Alliance House, located in an old fire station at 1724 S. Main in Salt Lake City, serves people who suffer from severe and persistent mental illness. As members, they participate in all aspects of keeping the house functioning, whether it be cleaning, cooking, grocery shopping, meal planning, accounting, or drafting the house newsletter. Staff, board members and members all relate on an equal footing and the goal is that members get strong enough to work outside jobs again and re-enter society. 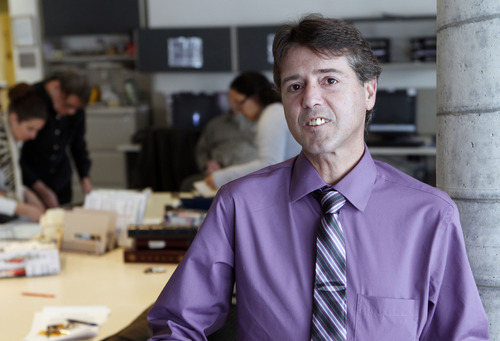 Al Hartmann | The Salt Lake Tribune Robert Grey, a three-year member of Alliance House, works in the business unit. He's bipolar and now, at 43, again works an outside job and has rebuilt most of the relationships that broke apart through the years. The nonprofit Alliance House, located in an old fire station at 1724 S. Main in Salt Lake City, serves people who suffer from severe and persistent mental illness. As members, they participate in all aspects of keeping the house functioning, whether it be cleaning, cooking, grocery shopping, meal planning, accounting, or drafting the house newsletter. Staff, board members and members all relate on an equal footing and the goal is that members get strong enough to work outside jobs again and re-enter society. With each day, Robert Grey gets back more of his life. Diagnosed with bipolar disorder in his late 30s, the Salt Lake City resident, now 43, recently achieved two hard-fought milestones: getting off government-funded disability and becoming self-sufficient again. He credits Alliance House, a nonprofit day center at 1724 S. Main St. in Salt Lake City, with providing the support that is helping him recover. "I was a walking zombie," Grey said of his mental state three years ago before starting his journey with Alliance House, which provides a hub of activity for him and hundreds of other "members" who find or rediscover valuable life skills inside its doors. Now marking its 25th year, Alliance House is one of 340 certified "Clubhouse Programs" in 30 countries that serve adults with severe and persistent mental illness, said Executive Director Daniel Braun. That status is earned by adhering to 36 standards designed to foster equality between members and staff in rebuilding shattered lives through a tool called the "work-ordered day." Salt Lake City&apos;s site serves as one of 10 international training bases for the innovative model, Braun added. In addition to Alliance House, Utah also has two other certified clubhouses, in Utah and Tooele counties. By involving members in productive work, the program focuses and builds on their strengths, talents and abilities rather than their mental illnesses. That work runs a gamut of tasks that keep the entire clubhouse functioning, such as newsletter production, accounting, data entry, reception duties, statistics, correspondence, meal planning, preparation, cashiering, janitorial work and lawn care. The Salt Lake City clubhouse serves about 50 members a day, said Development Director Sue Weaver. Each one has been referred by medical professionals and must have a serious, persistent mental illness such as schizophrenia, bipolar disorder, severe depression or anxiety. Membership is voluntary and has no time limits  as set forth in the 36 standards. Members set their own goals and pace, with the ultimate aim being re-entry into society. "We focus on employment, education, housing and relationships," Braun said, "and those relationships are the key glue that holds it all together." Shaking the stereotype • After the shootings in Newton, Conn., the National Rifle Association called for putting more guns in schools and building a bigger database of people who have been treated for mental illness. In response, the National Alliance on Mental Illness (NAMI) condemned the NRA&apos;s stance, arguing it would further stigmatize and discourage those who need real help. "We need to sit down and have a real conversation," said Rebecca Glathar, NAMI Utah&apos;s executive director. Rather than easy answers and quick fixes, Glathar hopes the horrific events at Sandy Hook Elementary spur real dialogue and meaningful change. "The first step would be to look at our mental health system and ask if we&apos;re adequately funding it and whether people who need the services can get them." Glathar said. "For the most part, I would say no." Glathar praised Alliance House for giving people with mental illness a place to socialize, gain skills and contribute to society. "We are social creatures and need that interaction," Glathar said, adding that people with mental illness are often isolated by societal stigma and fears. It works because members work • Equality goes beyond lip service at Alliance&apos;s old firehouse turned clubhouse. "We have members participating in everything we do. They have as much ownership and investment in the clubhouse model as anyone else does," said Bill Rice, a longtime member who battled chronic depression and now serves on Alliance&apos;s board. For Grey, that engagement helped set him on the road to recovery. "The work-ordered day," he said, "got the dazed and confused look out of my eye and my brain functioning again." While he still cannot remember large chunks of the past decade, Grey does recall fragments of his devastating breakdown. "Mine hit at [age] 36," Grey said. "No sign of nothing, then 36  boom  and they said it was stress." At the time, Grey said, he lost all support. "It was like I didn&apos;t exist anymore." Professionals first told Grey he had suffered a psychotic break. The bipolar diagnosis came later, a mental illness that, in hindsight, Grey believes has been with him throughout his life. But the potent medications prescribed to subdue his mood swings also robbed him of mental activity, eventually leading to the determination that he could no longer work. "I lost two years being doped up," Grey said. "I had nine hospital visits in two years and was almost sent to the state hospital. That&apos;s when they put me on disability and said, &apos;You&apos;re retired ... you can&apos;t mentally handle a job.&apos; "
Grey now takes other medications and, with help from Alliance House, has defied that harsh prognosis. He works full time as a packaging operator in an area business and is off government disability.That achievement means a lot to Grey. "Disability wasn&apos;t enough to live on, for one thing," he said, "and I had 20 years left; what am I going to do with my life?" s land permanent jobs, offering assistance with résumés, cover letters, interviews, job applications, references, training and more. Nearly 50 members now have such jobs, said staff member Amber Mackay, while seven finished high school and one graduated from the U. last spring. "Once you learn how to do it here, you take it outside," Grey said. "The treatment you get here is in layers ... so the crash and burn is over." Beyond the meds • "We&apos;re purposely short-staffed," Braun explained. "That makes the members absolutely vital, and then they discover their strengths." Alliance House employs 10 staffers and functions on an annual $1 million budget, Braun said. Besides the day center, the program maintains 29 apartments for homeless members and those at risk of becoming homeless. "Alliance House turns the medical model on its head," said Braun, a licensed clinical social worker. The old mind-set had been, "You&apos;re a client, you need us to take care of you. Don&apos;t ever try to work again, don&apos;t expect to have a spouse and family,&apos; " Braun said. , Braun noted. What that model lacks, however, is "no safe place to grow and to bloom and to use all of your strengths." That&apos;s what Alliance House delivers. Building on what works • Looking ahead, Braun hopes to procure $70,000 from the state to combine with a $35,000 Hearst Foundation grant in order to double Alliance&apos;s housing units. Of its 29 units, it owns nine and operates 20 in conjunction with Valley Mental Health and the U.S. Department of Housing and Urban Development. Last fall, all the units were full, with a waiting list of 30 names. Alliance has attracted bipartisan fans on Utah&apos;s Capitol Hill. "I can&apos;t praise them enough. I support their efforts and the funding they&apos;re asking for," said Sen. Todd Weiler, R-Woods Cross. "Every dollar invested there is probably saving $10 down the line." a savings of nearly half a million dollars, Braun said. Incarcerations also fell, from 11 jail stays before Alliance House to none since, saving more than $120,000. The National Alliance on Mental Illness pegs the U.S. economic toll for untreated mental illness at more than $100 million a year.For Grey, the bottom line is more incalculable. He got back his life, thanks largely to Alliance House. "If it wasn&apos;t for this place," he said, "it wouldn&apos;t have happened." Mental illnesses are biologically based brain disorders that fall along a continuum of severity. Widespread • Mental disorders make up four of the 10 leading causes of disability in the U.S. and other developed countries.